ClockNine is excited to introduce Smart Content™. Smart Content™ actually manages itself giving you the perfect ad for any situation. One file is deployed into your digital network and that single ad adapts to its environment. Headline, imagery, product and pricing will all change as the file reaches its unique destination. Sound too good to be true? Well here’s a little insight on how the technology works. Smart Content™ is infused with live data feeds. Each time the content plays, it checks in to see if new data is available. Once parsing that data, the content then adapts its offerings based on the information that is received. By looping data into each file, we are able to provide fresh up to date content that is truly unique. The ClockNine creates content Smart Content™ is continuing to evolve. With the rapid growth of big data, we are constantly finding ways to build upon our technology. Below are a few videos that highlight some basic Smart Content™ offerings. Stay tuned as we continue to innovate. 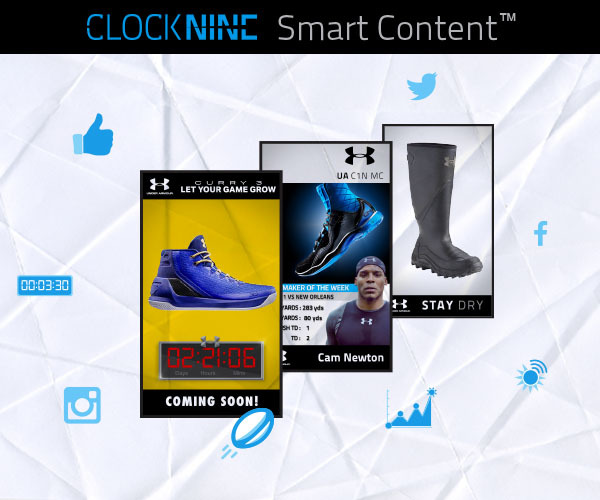 To learn more about how ClockNine Smart Content™ can improve your digital efforts email GoDigital@ClockNine.com.